I'm getting very, very sleepyOur new mattress set was delivered today and it's all I can do not to fall asleep while typing. We've been sleeping on a very hard mattress for far too long and now I can hear my plump new bed calling my name. 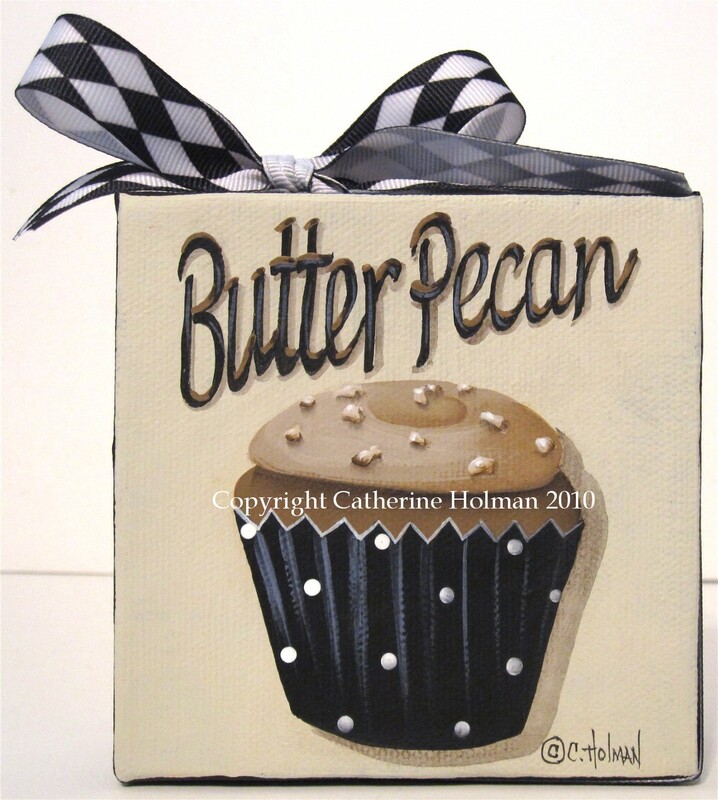 Before I head off I just wanted to let you know that this cute little "Butter Pecan Cupcake" painting ends tomorrow night on eBay. The yummy taste of Butter Pecan Ice Cream is replicated in this cupcake topped with vanilla bean flavored Butter Cream frosting. Chopped pecans are sprinkled on top. 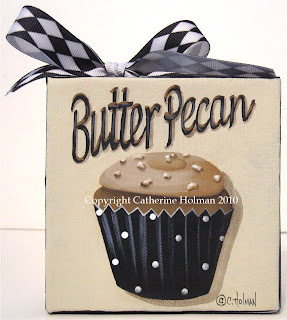 A black and white harlequin ribbon is wrapped around the edges of the canvas and tied in a bow at the top. And this lady was so proud of the pastries in her bakery that she told our son, Eric, that she wanted to show us her ovens. We followed her out of the bakery and past a couple of doors down the alley we entered a room where her husband was busy taking pastries out of the oven. We then followed her back to the bakery where we purchased our fresh, hot treats and sat outside to devour them. See that castle on the distant hill? Well, really it's only the top half of a castle. We walked from where I'm standing taking this picture to that castle and that's not even where we started from. I had to throw away one pair of shoes when we returned home. Thank goodness I bought a new pair of tennis shoes before we went to Spain. This is the plaza in Chinchon. In the summer this area is closed off and used for bull fights. and here is the beautiful view beyond the castle. I love all the olive groves around this village. After all the noise of Madrid, Chinchon was amazing quiet and peaceful. What a lovely place and such sweet people. Now I'm off to test out that new bed! What great pics! So many wonderful memories! Well, great minds think alike! I did a post 3 weeks ago, saying I was taking a computer break too! And I did mine in France! I returned Sunday. OH wow such beautiful photos of you trip..... what gorgeous place.. and as usual your painting is so beautifully sweet..... have a great week and enjoy your new mattress.. Thanks for sharing your Spain trip with us! I love seeing pictures of other countries. I love your cupcake painting too! Happy sleep! Oh a new mattress! You are going to sleep like a gueen! I enjoy looking at your vacation pictures. This little village/countryside reminds me of Assisi in Italy. Beautiful and so peaceful! Absolutely lovely pictures. You did a great job capturing the feel of the place with your descriptions and photos. Thank you! It worked out well this way because my passport is expired! Wow, your photos of the castle are fabulous! What a wonderful trip. I love the new painting!